Mention DDRI when making a purchase, and 10% of your order will go to DDRI. Welcome to Deaf Dane Rescue Inc.
DDRI Has a New Home! DDRI Graduate becomes Certified Service Dog! Local vet Dr. Cary Heyward of Amazon Park Animal Clinic has been helping us out for quite a while now with discount services, and giving us as many freebies and deals as possible. Without Dr Heyward's help, DDRI would likely have had to close its doors long ago. Top quality vet care, and pricing to help rescue. What more can anyone ask for. All the pups say thanks Dr. Cary! We have a new feature, the DDRI Store. Be sure to check it out. You'll find all sorts of exciting stuff, including books and videos on dogs, dog training, and deaf dogs. The proceeds from sales at the DDRI Store go towards funding DDRI itself. To make the store as useful as possible, we have affiliated with Dogwise, a fantastic place for the dog lover. Now any purchase you make though our portal will help fund DDRI! We get a commission on any Dogwise sales when a person shops Dogwise by entering through our portal. To find out more about this be sure to check out our store. With the recent influx of dogs, and some recent vet expenses, our budget is stretched past its limits. Our only sources of income are adoption fees, and sales from our new DDRI Store. If you can, please help us out by doing your shopping via our online store. We get a percentage of everything sold through our store and with affiliates like iGive, Petsmart, Dogwise, Flowers for Rescue, ShelterCare, and others, you can find almost anything you need while ensuring that a portion of your purchase goes to help our needy dogs. To serve to the best of our abilities the needs of deaf Danes whenever and wherever we can. To do our utmost to find a placement in an appropriate and loving home for all deaf Danes entrusted to our care, and to support that placement with post-adoption training and follow up contacts. To ensure that all deaf Danes are treated with dignity and are given every chance to have a quality life, and that no Dane is ever killed simply because they are deaf. To personally care for those dogs we are not able to place in a loving home for any reason. To raise the general publics awareness about the realities and facts of deaf Dane ownership. To fight the stereotypes of deaf Danes as unstable, unhealthy, stupid animals that can't be trusted and do not deserve to live. To work in cooperation with vets, Great Dane Clubs, breeders, and others, to increase breeder awareness of the genetic issues that lead to deafness in Great Danes and to help avoid breedings that will result in deaf Dane puppies. To promote spaying and neutering of all pets, and responsible breeding practices to reduce the number of dogs that cannot find their "forever" homes and must live out their limited days in shelters or on the streets as part of the pet overpopulation problem. To offer whatever aid and assistance we can to any owner of a deaf Dane, regardless of whether that dog was a DDRI placement or not. To ensure that any deaf Dane that must be euthanized is treated with dignity and as a respected and valued family member, and that any dog under our care will pass on in the arms of a human friend. To promote awareness of what a special gift from our creator dogs are, what a responsibility mankind has to do right by these gifts, and how much more important it is that we do so for deaf dogs. 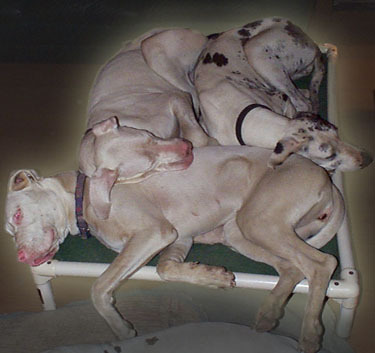 We use Patented Kuranda Dog Beds because they are durable, chew proof, easy to clean, and our dogs love them. If you would like to donate a bed to us, click here.